It can be tough at the top, especially when you garner a reputation for a particular type of camper trailer. That niche status can lock your customers into only seeing you through one set of eyes and others may simply pass you by because of your expertise. For owners Ian and Danielle Roberts, the All Terrain range was crying out for a new look. 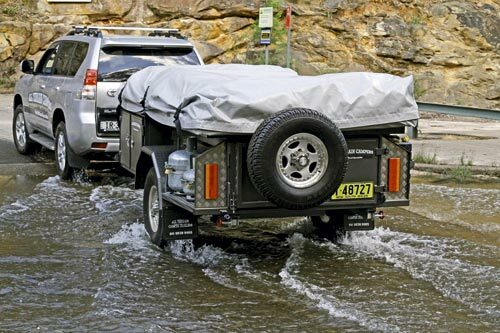 The new Tourer fills a void in the existing range of All Terrain walk-up trailers offering a sturdy, reliable, all-Australian-built offroad trailer worthy of the AT badge without needing a heavy-duty 4WD package for towing. And at the time of writing, the Tourer had already attracted its fair share of orders just a few weeks following its release. 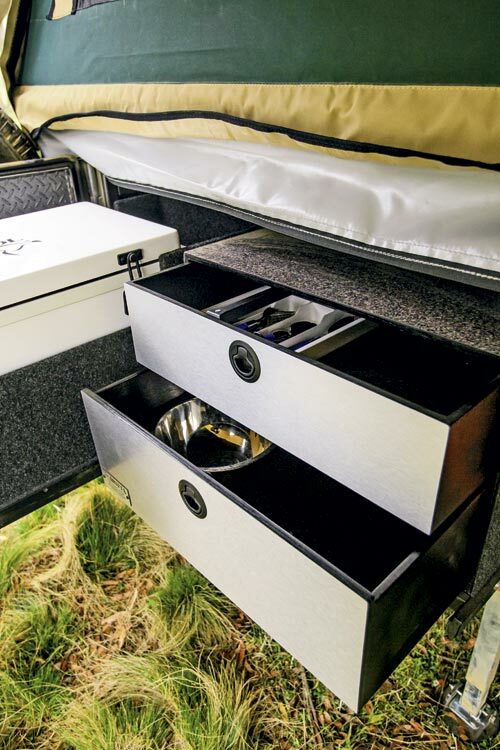 All Terrain — winner of two CTA Offroad Camper of the Year trophies — has produced tough-as-nails extreme offroad campers finished with top-notch canvas since its inception more than 15 years ago. Meeting the needs of its core market has seen the average tare of its trailers rise to just over 1000kg as modern appointments like complex electronics become standard kit. 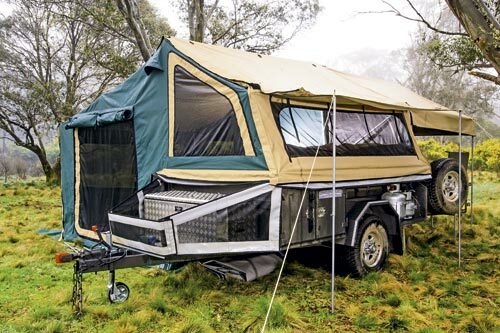 With many ‘softroader’ enthusiasts keen to join the camper trailer fraternity, Ian and Danielle set out to design an AT original with smaller 4WDs and SUVs in mind. 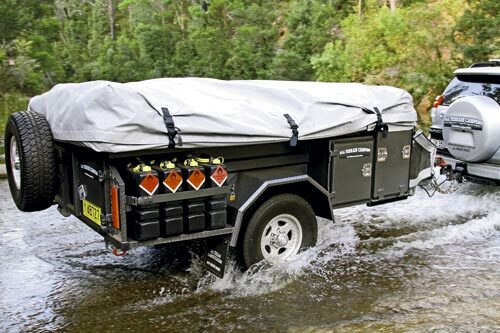 All Terrain’s traditional specifications for its extreme offroad range incorporate a 100x50x3mm one-piece drawbar that continues to the back of the trailer; the new Tourer model is a shorter unit which has a smaller frame under the box measuring 50x50x3mm. All Terrain introduced flat 1.6mm steel into the Tourer body where possible, retaining 2.1mm checkerplate for strength as required. 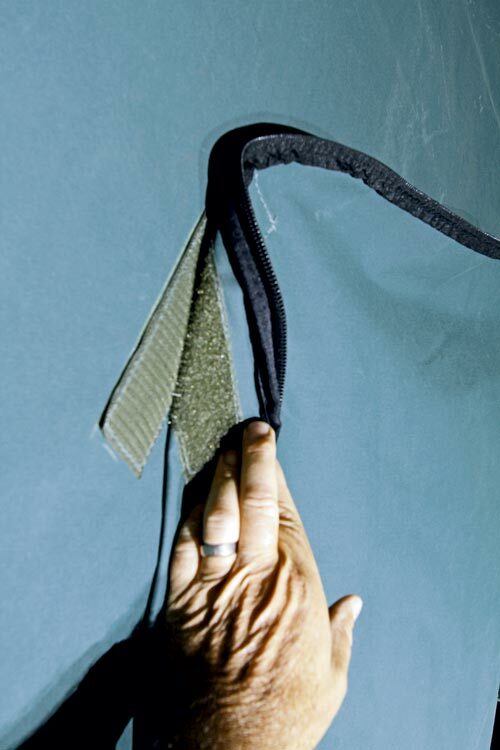 The Wax Converters canvas walls for the Tourer are 12oz and the roof is 15oz. 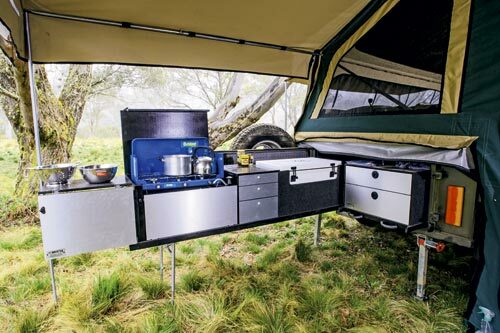 It is also fitted with a slide-out Drifta ply kitchen featuring carpet and stainless-look laminate finish, shaving around 100kg of weight compared to the stainless steel kitchen units seen on the Tourer’s stablemates. The Tourer weighs 850kg and its agile dimensions are noticeable as you manoeuvre it at the campsite and as your drive. 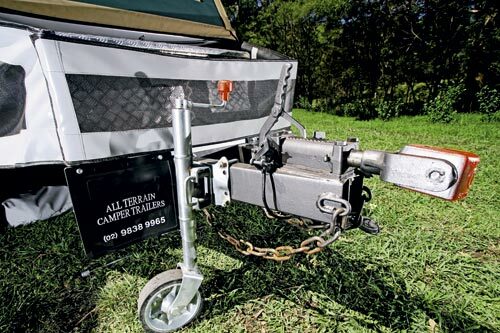 Campers will find the Tourer cost effective to tow and easy to drag up a shaley slope out in the bush. 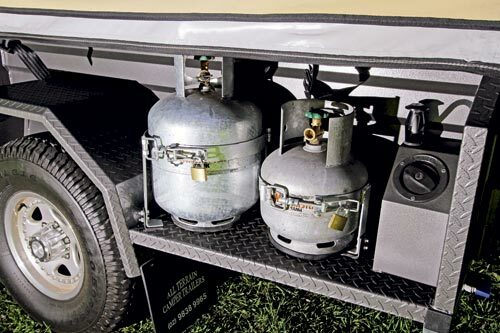 Released at the recent Newcastle Regional Show and at the regional Albury Show, the trailer had instant success with orders taken from the get go. People liked what they saw. 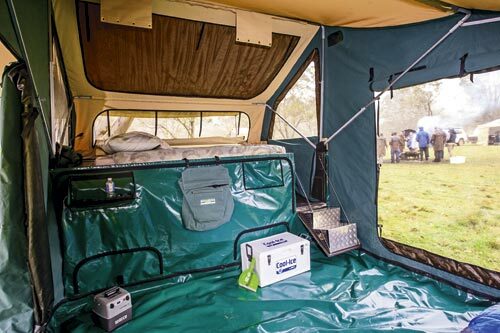 The canvas has the same excellent features that have helped make All Terrain’s other campers famous. 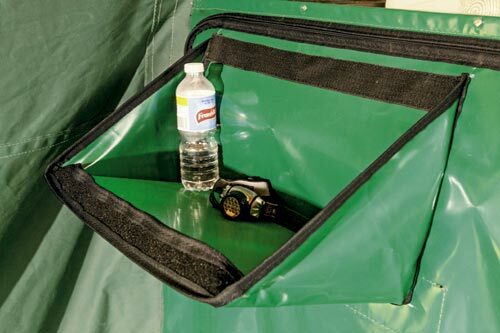 The entrance support that holds the door open, the laundry bag near the bed, and the large air vents are all notable inclusions. We also like the two coat-hanger tabs on the peak hood bow, the internal storage pockets and the vinyl ‘shelf’ fitted with a removable chopping board base next to the bed for sundry items. 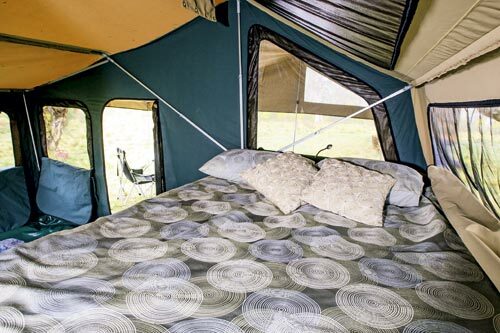 The vinyl floor is seam welded for safe and easy removal and the tent features large metal D-rings at its base for sand camping. 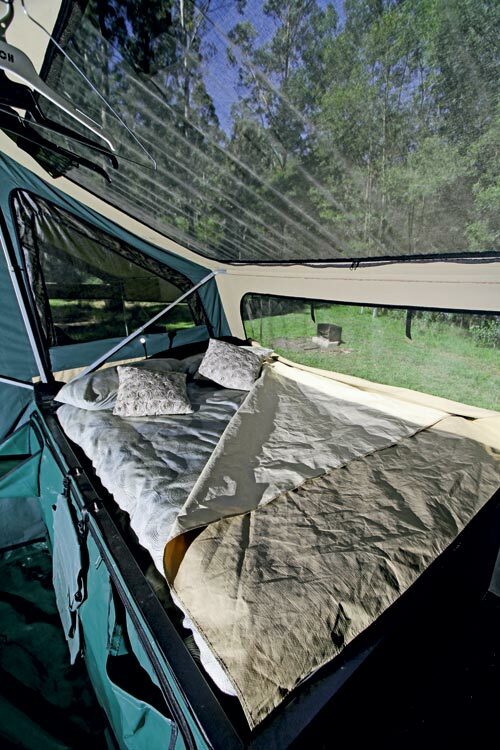 The Tourer also features All Terrain’s signature skyroof above the bed, which caused a stir when it was first released three years ago. Imagine lying under a desert sky at night — what a way to go to sleep. There are three sub-awnings over the large windows including a 2.25m awning across the back of the trailer and a standard skylight at the end of the kitchen. Canvas options include extra walls, a 2.9x2.9m kids’ room and shower room. 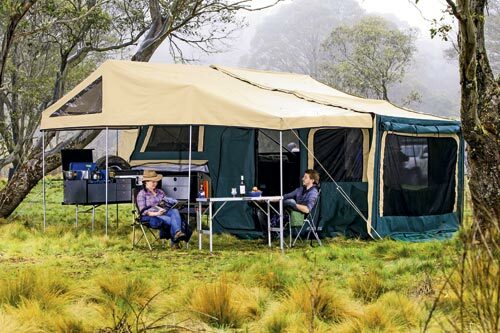 The tent folds out simply and easily revealing a 2.9x2.9m floor excluding the bed, so there’s no need to adjust the tent bows, making set-up and pack-up easier. 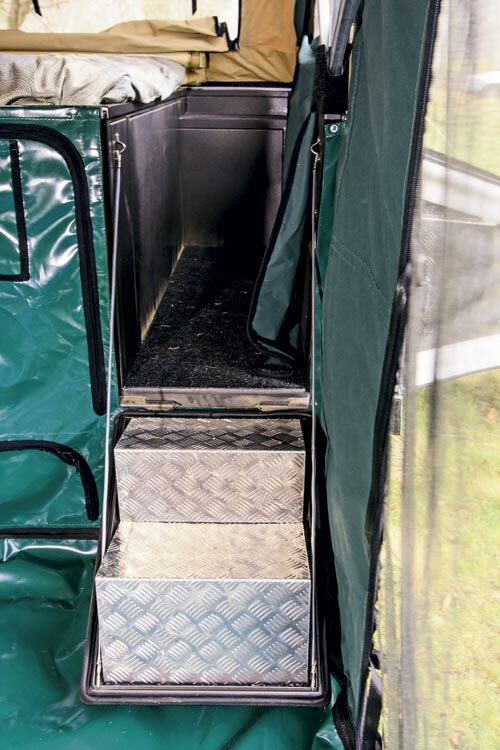 The walk-up access is still the same basic structure, with a set of fold-down aluminium steps to access the carpeted aisle at the foot of the bed — a great place to carry all sorts of goodies. 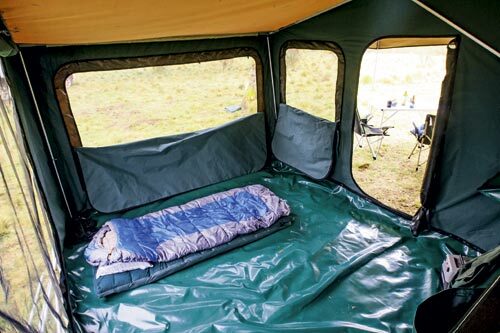 The queen-size berth includes a 150mm high-density foam mattress (innerspring is optional) and a zip-off protective cover, a single flexible LED reading light, two built-in 12V plug points and two storage tubs at the head. The kitchen slides on the checkerplate floor and simply requires a spray of silicon once a year to keep it in tip-top shape. In its standard form, the kitchen features a three-burner camp stove with a pull-out shelf in front to hold a stainless steel tub as a sink. However, a two-burner built-in Smev stove and stainless sink combo fitted to an electric water pump is optional. The removeable stainless tub also comes in handy as a salad bowl. The kitchen includes three drawers for cutlery and utensils and a 60L EvaKool fridge/freezer at the inner end. 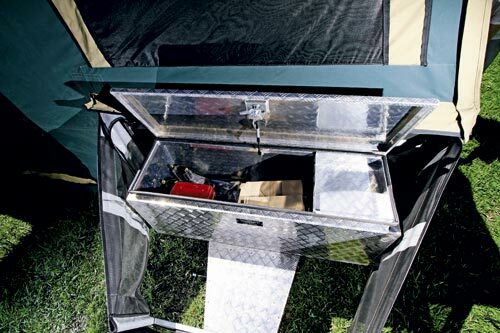 Snap-on fittings engage the gas stove and tap when it comes time to set up camp. Next to the kitchen is another large slide-out box, with two large 410x570mm drawers at the front, a laminated bench space on top and a huge carpeted 1580x890x380mm deep tub behind. This occupies all the storage space back to the walk-up aisle. 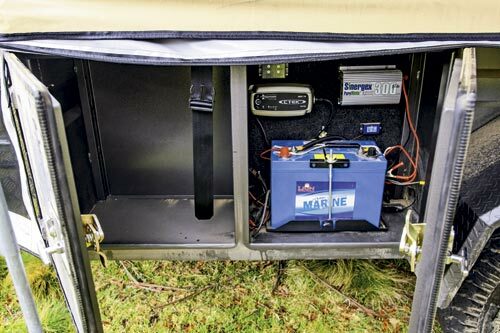 The electrics consist of a single 100Ah gel battery, voltmeter, 300W inverter and 10A smart charger as standard, but can be optioned up to a single 120Ah battery or two 100Ah units using an adjoining spare locker. There are the two 12V plugs next to the bed and two more at the kitchen. LED strip lights inside are optional. Appointments under the trailer include the heavy-duty poly 76L water tank, solid 50mm axle, seven-leaf eye-to-eye spring set with rebound springs and mechanical override disc brakes. The 12in Al-Ko electric drums are optional. The whole package rides on 16in mags with All Terrain tyres. The All Terrain Tourer isn’t unique in its level of fitout. There are other similar-spec trailers out there but at $24,990 it’s well priced for what you get, especially when you consider the brand prestige and impressive canvas. The Tourer’s immediate acceptance by the market indicates that it’s a good balance of quality and fitout. 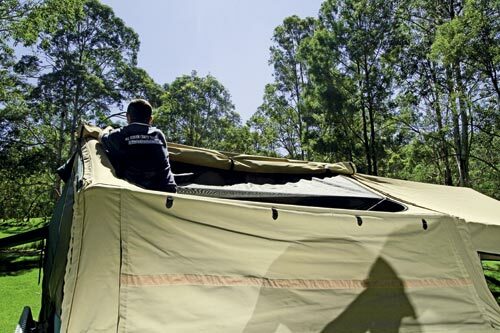 Originally published in Camper Trailer Australia #63, April 2013.